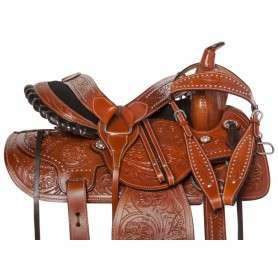 This beautiful chocolate brown all leather back cinch with hand painted blue leaf tooling is a perfect addition to your tack collection and will fit most western back cinch billet straps. The hand carved leather will match a variety of saddles and add a little color to your everyday riding. The back cinch features a leather strap to tuck your billet straps into to prevent any excess straps from hanging off of your horse. The underside is soft and well padded to prevent pinching and chafing, even against sweat, while keeping your horse comfortable throughout the ride. 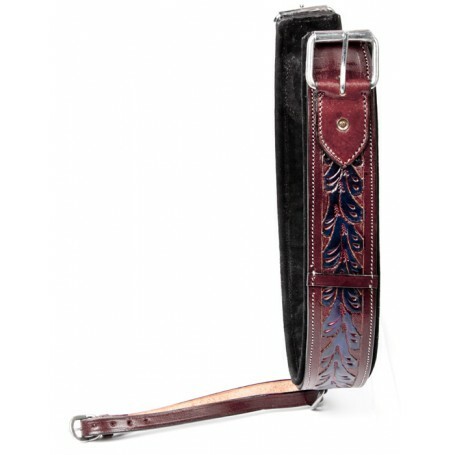 Measurements: Color: Brown, Blue Leaf ToolingLength: 36" buckle to buckleWidth: 3" with 2.5" bucklesConnector Strap: 9"-11"
This beautiful chocolate brown all leather back cinch with hand painted blue leaf tooling is a perfect addition to your tack collection and will fit most western back cinch billet straps. The hand carved leather will match a variety of saddles and add a little color to your everyday riding. The back cinch features a leather strap to tuck your billet straps into to prevent any excess straps from hanging off of your horse. The underside is soft and well padded to prevent pinching and chafing, even against sweat, while keeping your horse comfortable throughout the ride.